Moss, Lichen and Algae are common problems caused by the damp British climate. It can look unsightly and also be slippery on a wet day. 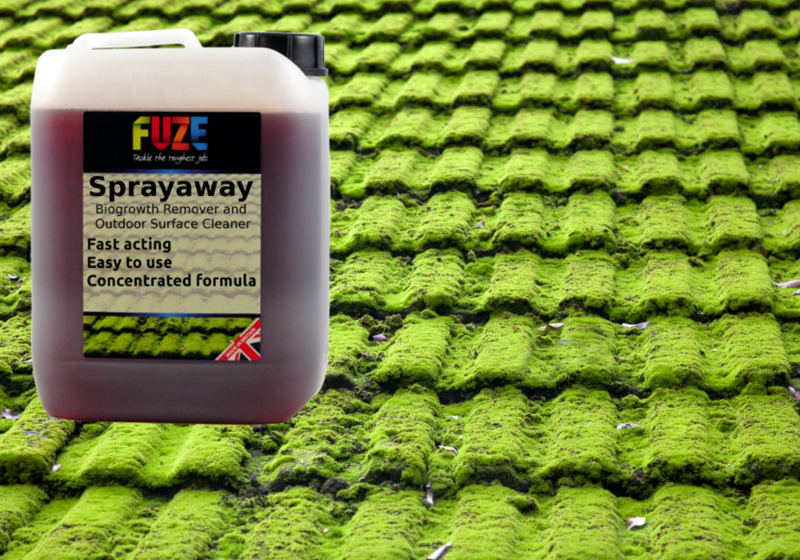 Roof moss can ultimately cause damage to tiles and be the cause of blocked gutters. Whilst Sprayaway in itself is not a particularly hazardous product, it is important to realise that it is a chemical and should be treated with respect. Wear gloves and eye protection whilst using the product, and wash product off hands etc immediately after use. Sprayaway is not toxic to pets, but keep it out of things like garden ponds. Sprayaway is biodegradable, and will be OK down foul drains. The biggest safety issue though will be ensuring your safety if you are intending to remove moss, lichen, algae off things like high roofs. This is a specialist job. If you undertake it yourself you must ensure safe access to the roof, and your safety when on the roof e.g. use a safety harness attached to something solid like a chimney pot, get ladders properly footed, ensure nothing can fall off the roof and hit anyone working below. Dilute 1 part product to 5 parts water. Spray directly on to the area you need to treat using a watering can or a knapsack sprayer or some other suitable means. let nature take its course – over a couple of weeks the British weather normally does the trick and the dead moss, algae and lichen just washes away. on porous roofs such as concrete tiles, the powerwasher forces water into the tile surface which makes reinfection more probable.